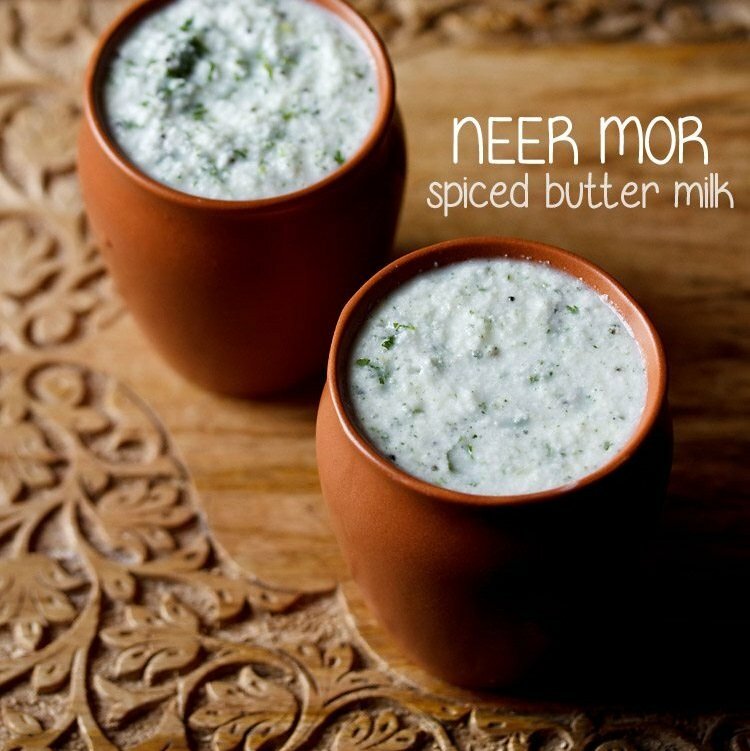 neer moru recipe or neer majjige or neer mor is a delicious spiced buttermilk from the south indian cuisine. neer moru used to be a regular at my place during the summers. sharing my mom’s recipe which is even today one of the preferred summer drinks with my folks. 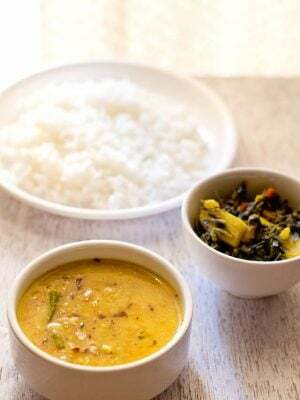 there are many variations in preparing neer moru. we usually blend everything in a blender. 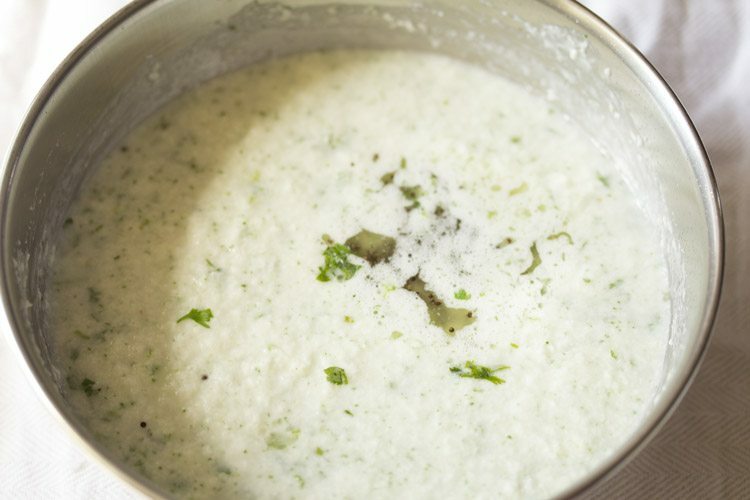 but you can also use a wooden churner and churn the curd and then add the herbs and spices. surprisingly neer mor was not updated on the blog even though it is one of the drinks i prepare during summers. 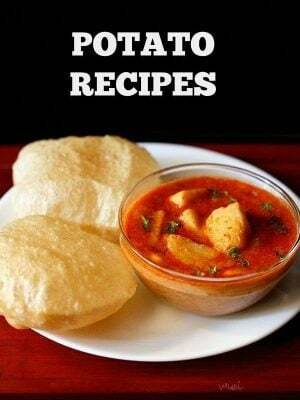 since its ram navami, thought of sharing the recipe. during ram navami, neer moru along with kosambari and panagam is offered to lord rama. 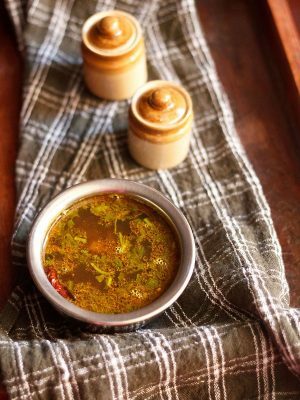 green chilies are added in neer mor to give some heat and spiciness in the drink. you can skip green chili and add some black pepper. some roasted cumin powder can also be added. i prefer to temper, but you can skip tempering. 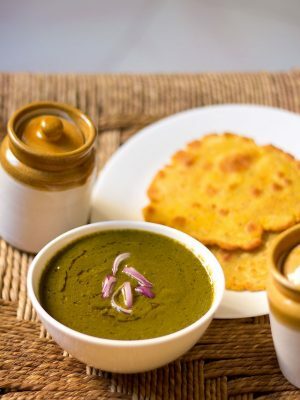 you can serve neer moru as an appetizer or just a cooling drink. you can also have it after your meals. 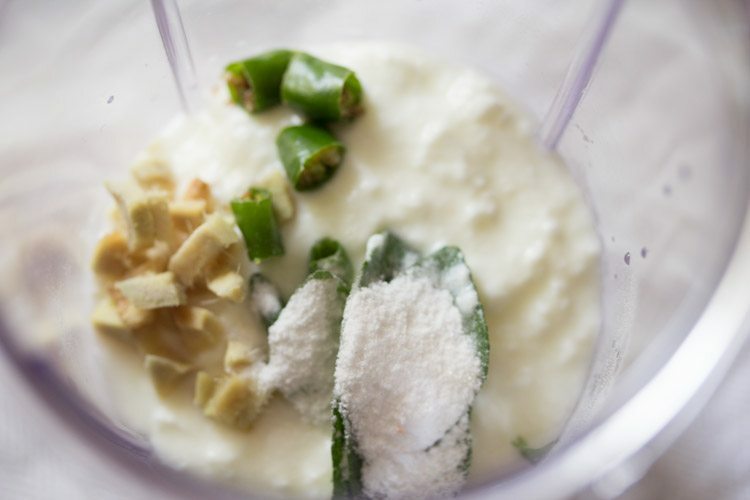 in a blender jar - take 1 cup curd, chopped ginger, green chilies, curry leaves and salt as required. add 1 cup water. blend very well. some butter floating on top is fine and tastes good. 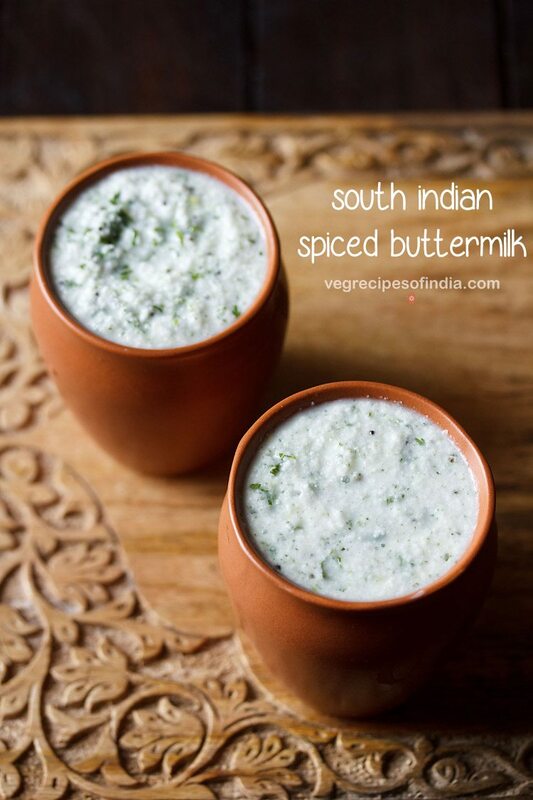 pour the spiced buttermilk in a bowl or pan. then add 2 tablespoons finely chopped coriander leaves. mix and keep aside. 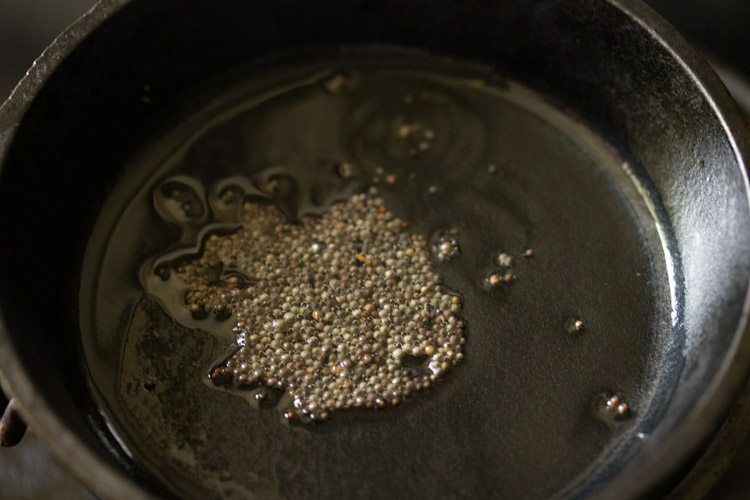 when the oil becomes hot, add mustard seeds and let them crackle. once they crackle, then add a pinch of asafoetida (hing). mix and then quickly switch off the flame. pour the tempering mixture in the spiced buttermilk. mix well. 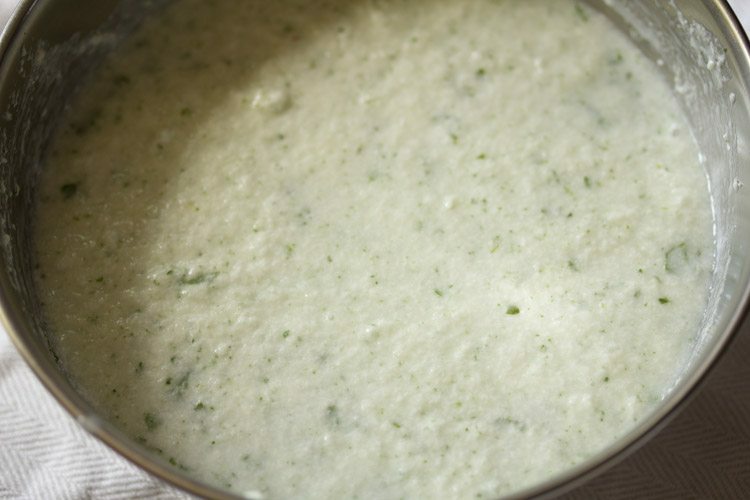 you can serve buttermilk immediately or chill it and then serve later. some ice cubes can also be added if serving immediately. 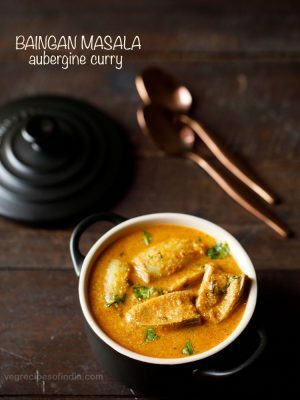 you can add less or more of the herbs and spices as per your choice. 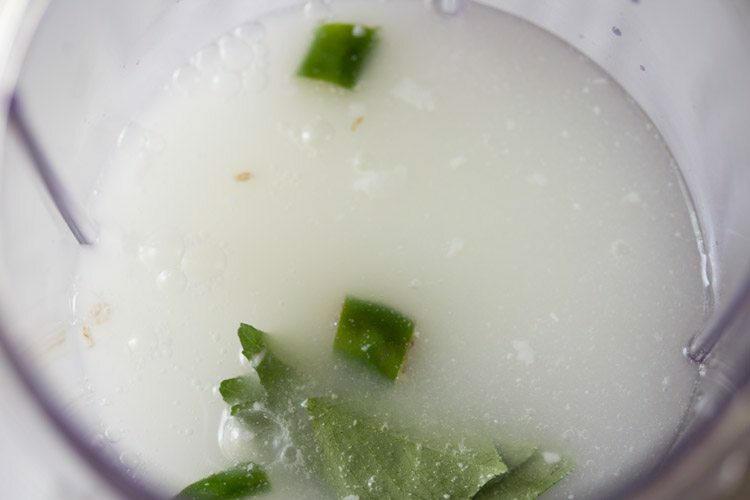 the spiced buttermilk can be made more thin, but add more water. 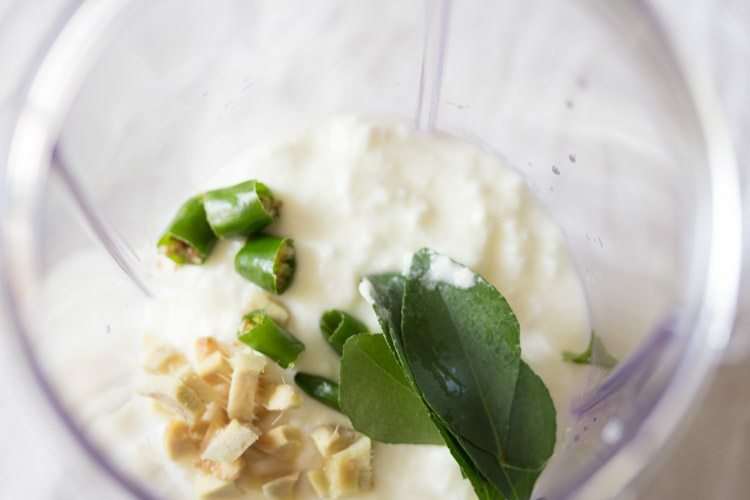 instead of blending everything, just blend the curd and then add finely chopped ginger, green chilies and curry leaves. for blending, you can also use a hand churner or a wired whisk. for a gluten free version of this drink, skip asafoetida. 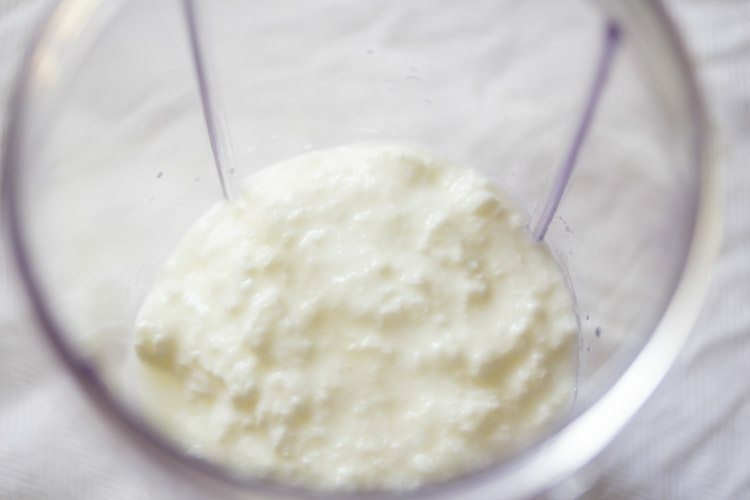 1. take 1 cup curd in a blender or grinder jar. 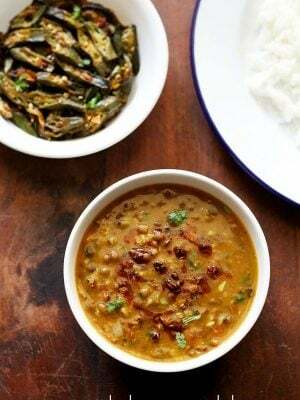 2. add 1 teaspoon roughly chopped ginger, 1 green chili (chopped) and 6 to 7 curry leaves. 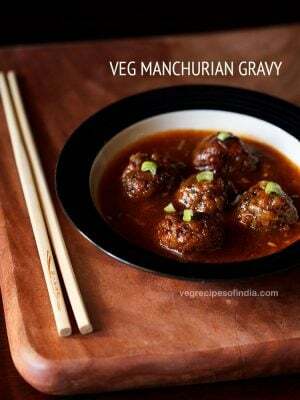 instead of green chilies, you can add ¼ teaspoon black pepper powder. 3. add salt as required. 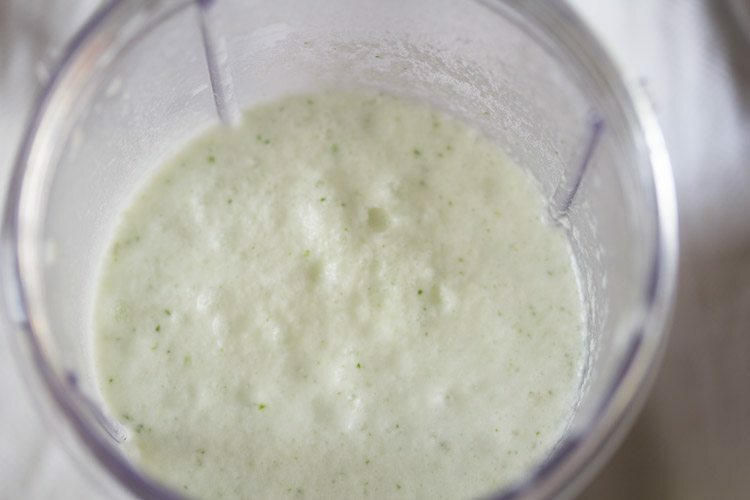 5. blend till smooth. a bit of butter getting churned after the blending and floating on top is fine and does tastes good. 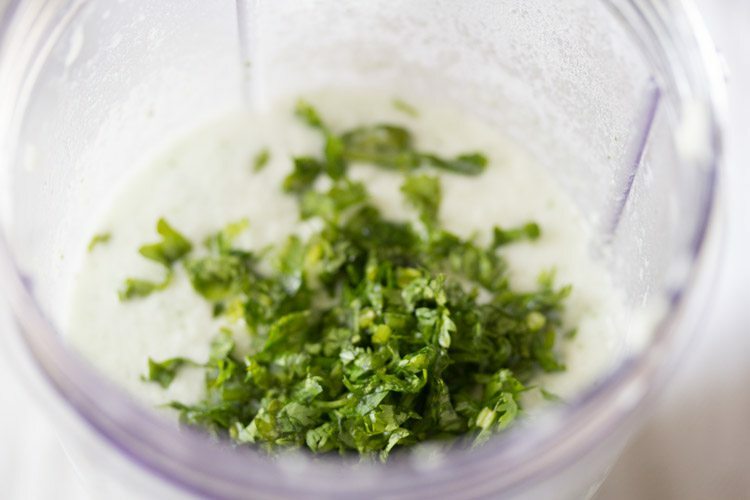 6. then add 2 tablespoons finely coriander leaves. mix very well. do chop the coriander leaves very finely. mix well. at this step you can also roasted cumin powder. 7. now pour the spiced buttermilk in a bowl or pan. check the taste and consistency. for a more thinner consistency, you can add some more water. add salt if you feel its less. 8. heat 1 teaspoon oil in a small pan. 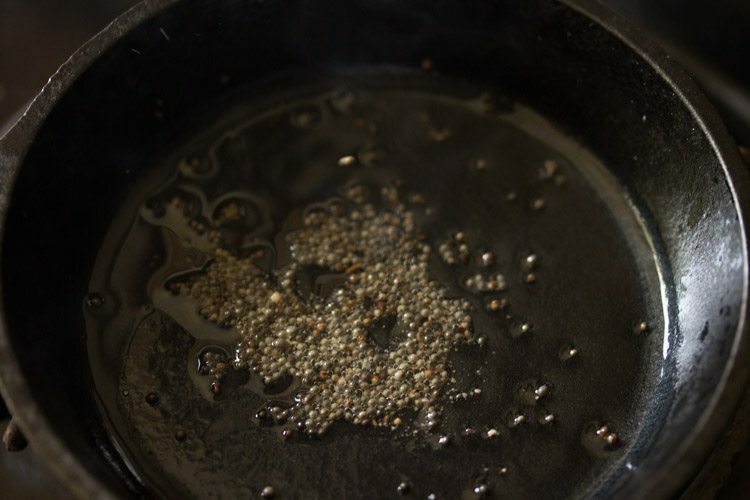 add ¼ teaspoon mustard seeds and let them crackle. keep the flame to a low. 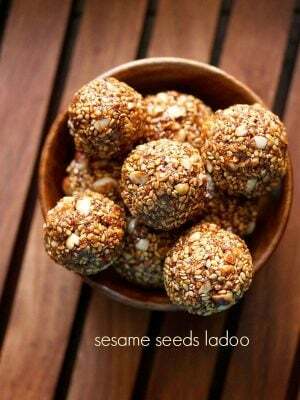 9. once the mustard seeds crackle, then add a small pinch of asafoetida (hing). stir and then quickly switch off the flame. 10. pour the entire tempering mixture in the spiced buttermilk. mix very well. 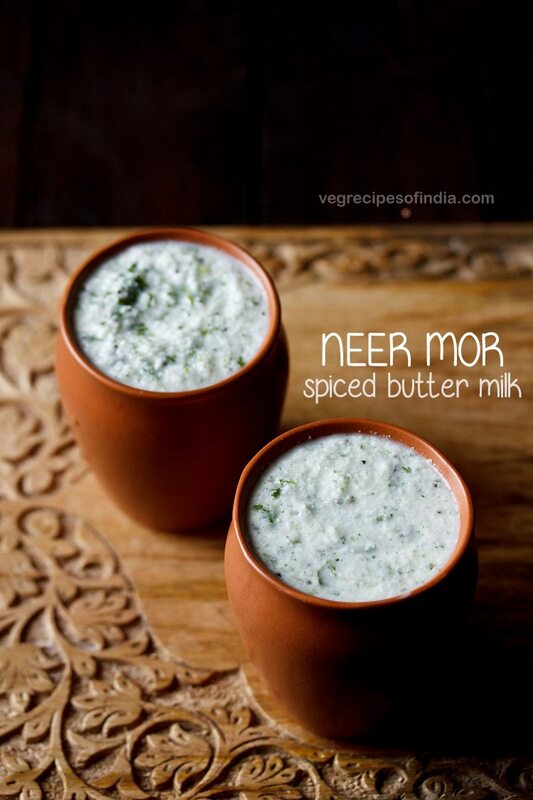 11. you can now add some ice cubes and serve neer moru or you can refrigerate and serve neer moru later. if offering to deities or preparing for ram navami, then refrain from tasting.